I was pretty happy to finally make something on my long list of projects this past weekend. I had been wanting to make a four seasons framed art piece since January when I found this frame at the Christmas Tree Store in Colonie. It took me a few tries to get the color combos that I thought would look nice together. I decided to mat all four pieces on a 4″x6″ piece of basic black card stock. I think it really helps it pop. I did have a couple problems, first was I didn’t know how to get the frame apart to slide the finished pieces inside. I ended up trying to pry the back off and ended up breaking one glass panel. I’m off to a local glass shop to get a new piece made, right now scotch tape is holding lovely “Spring” season in place. Hope you can’t notice that in the photo. So I’m offering this as a class, on Saturday May 2nd, three options either 10 am, 2 pm or 6:30 pm. I decided to offer three time slots as I know how busy everyone is and thought it would make sense to offer it morning, afternoon and evening. Plus, weekends are precious and few and some weeknights are out for me. Hopefully this will work well. This class is in my home, and will be a small group (I limit classes in my home to just 8 people as that’s what fits comfortably in my craft room). 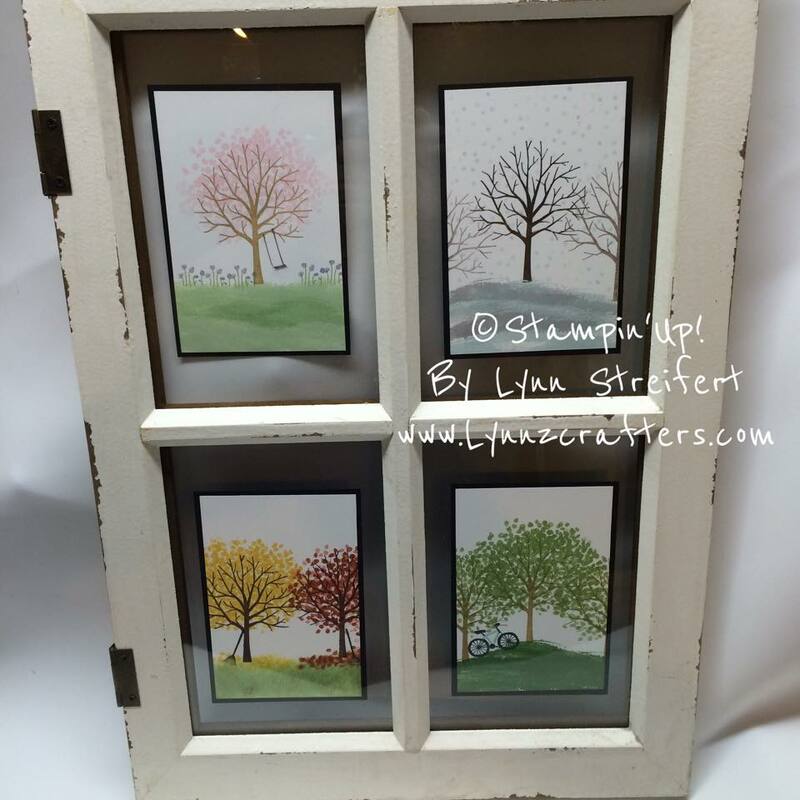 This is a $25 class which includes the stamp set Sheltering Tree. Let me know if you have any questions… hope you can attend this fun class what a great Mother’s Day or birthday gift for someone special! Prepayment and registration is due by April 22nd by 8 pm… that is my birthday and I’d love to be putting in a nice big order of stamps for this class! Hope you can make it! Thanks so much, feel free to pass this info on to your friends and family who might like to come and make these four season inserts. (You provide the frame). « You’re Invited to a Spring Fling!